Looking for an everyday cake? 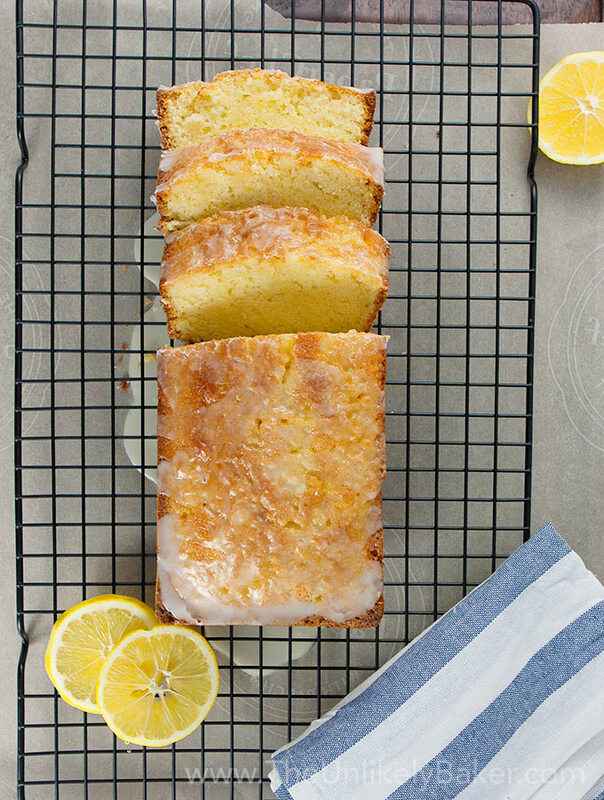 This easy yogurt cake is it. Easy to make, even easier to eat! Dress it up with whipped cream and your favourite fruits or eat it plain with your morning coffee. It’s a treat we deserve every day of the week. Hello everyone! How are you? We are inching closer to summer and you know what that means on TUB…our No Bake Summer Series! We’re turning our ovens off again this year and spending as much time outside as we can while still devouring everything dee-licious. We’re not quite there yet though so today we are doing a little baking but I promise you, this is the easiest cake ever. Just whisk, stir, pour and bake. Dress it up or down, it’s delightful. 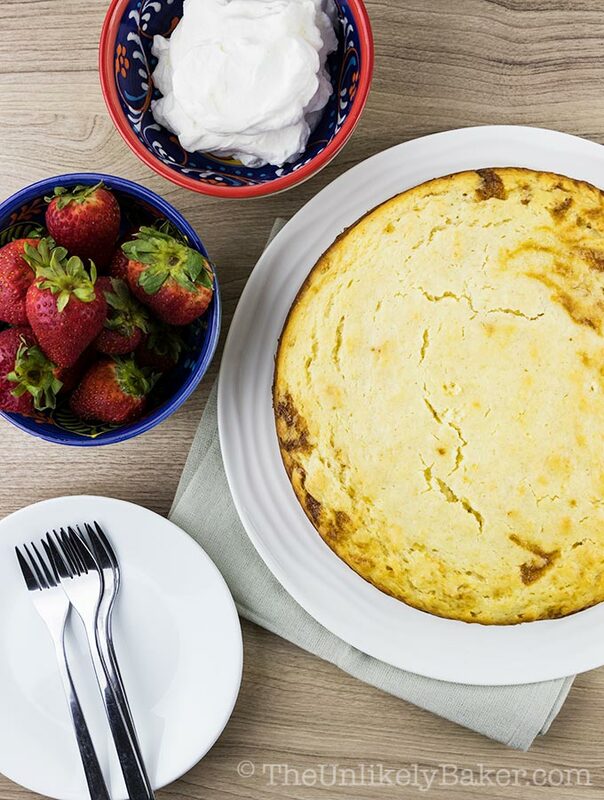 Like a lot of the recipes here, this easy yogurt cake is a result of that sad tub of yogurt nobody wanted. Background: we consume ridiculous amounts of Greek yogurt at home. And we always buy a particular brand. But one time this other, non-Greek yogurt brand went on sale and who can resist a sale? (Evidently not me). So we tried it and realized we miss our old yogurt. So this tub of yogurt sat at the back of the fridge. Fortunately, yogurt is an excellent dairy to use in baking. Not only does it add that characteristic tang, yogurt also reacts with baking soda to encourage leavening. It also adds richness to your cakes and brings with it all the healthy stuff that you already love about it to your baked goods. For this recipe, I used plain, full fat yogurt. If you’re looking for a recipe that uses Greek yogurt, try my recipe for White Chocolate Blackberry Muffins instead. This is really the easiest cake ever. No mixers, no fancy techniques. Just a bowl, a whisk and a pan. As is common in baking, not over-stirring the batter is important but that’s about it. 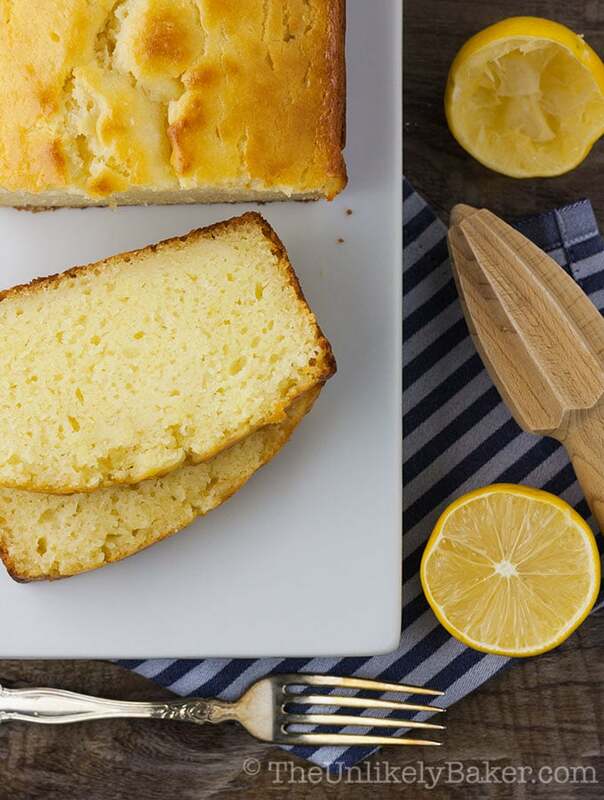 The texture of this cake is similar to pound cake. It’s dense, soft and not too sweet. It’s fabulous in the morning with your cup of coffee. It keeps really well too. It should be OK out on the counter for 1-2 days wrapped in cling wrap. You can also keep it in the fridge and it will keep for up to 5 days. 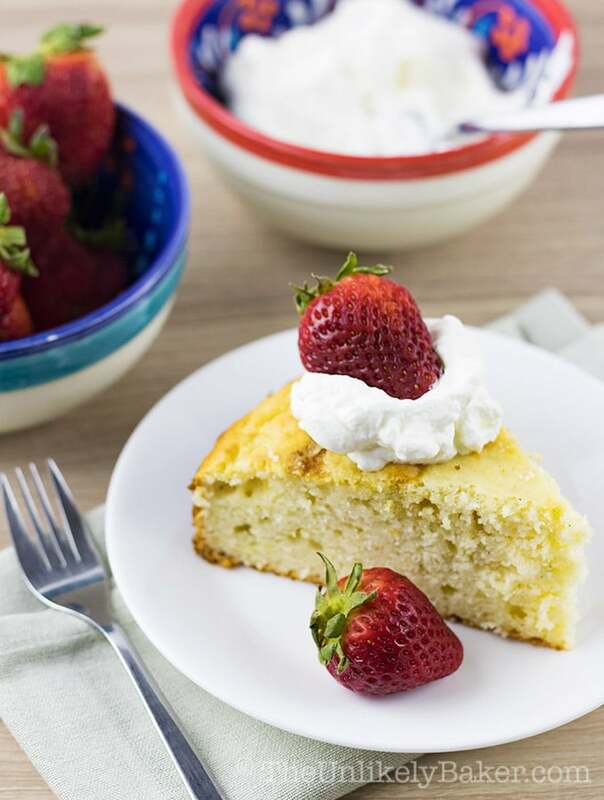 A quick 10-15 seconds in the microwave and you’ll have soft, moist yogurt cake again. Want to go crazy? Top it with whipped cream and strawberries (or your favourite fruit) like I do and you have a cake worthy of company. And really, now it’s strawberry shortcake isn’t it? This cake has become one of our favourites and I hope it becomes one of yours too! Looking for an everyday cake? 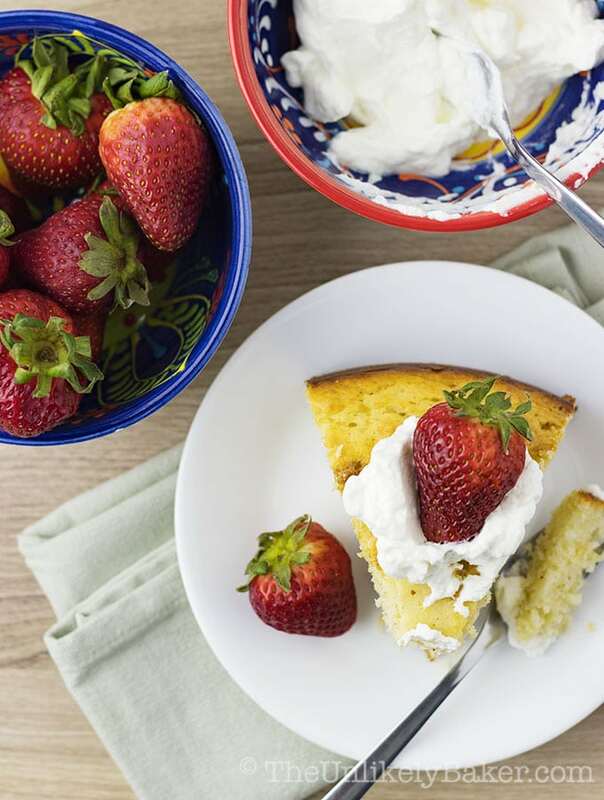 This easy yogurt cake is it. Easy to make, even easier to eat! It’s a treat we deserve every day of the week. Preheat your oven to 350F. Lightly grease the sides of a 9-inch springform pan and line the bottom with parchment paper. Set aside. In a large bowl, whisk all wet ingredients together until fully incorporated. Then add all the dry ingredients and gently stir just until combined and no big patches of flour remain. Do not over stir. Transfer batter to prepared pan and bake 45-50 minutes or until a toothpick inserted in the centre comes out with minimal (but not wet) crumbs (see note). Cool in pan for about 5 minutes then carefully run a small knife around the edges of the pan before releasing. Transfer to a wire rack to continue cooling. You can serve the cake at room temperature or a little warm. Optional: top with whipped cream and strawberries or your favourite fruit. Check the cake midway through baking and cover with aluminum foil if it's getting too brown on top. Continue baking until done. 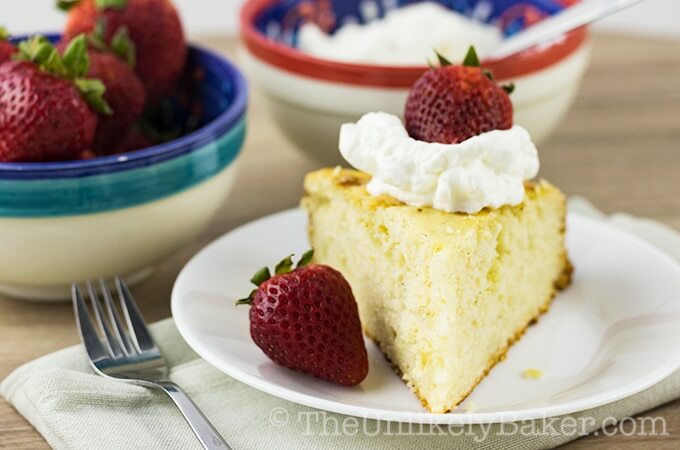 Did you make this super easy yogurt cake? I’d love to hear from you in the comments section below. I made this last week instead of strawberries we paired the cake with peaches. But my son likes it better on it’s own. Anyway it was very delicious. Easy even for a non-baker like myself. Love your recipes! So happy to hear that Paige thank you 🙂 And peaches sound delicious, they are gorgeous this time of year. Strawberries are my favorite. I made a strawberry cheesecake before so I know I’ll love this recipe of yours. I wouldn’t have thought about using yogurt to make cake! Great tip. And yes fresh strawberries on EVERYTHING. My momma used to make a strawberry shortcake for my birthday. This looks like it may treat my taste buds equally. 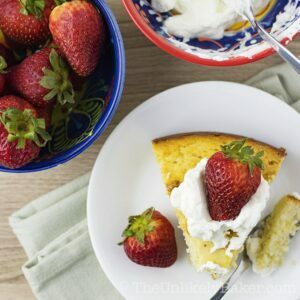 I love strawberries and cream and it tends to be something we have frequently in my house, but adding a yogurt cake sounds amazing!! OH YUMMY!!!!! This looks amazing and so fresh and good!!!! Your yogurt cake looks so delicious! I like how you can top it with different berries and cream to make it even better! Have to try out soon! This looks really easy and simple to make. I will have to try it this weekend. Cake looks delicious. Quick and easy… Sign me up for this. This looks sooo good! I didn’t know you could make cake this way. I will have to try this out. This looks really good. I love fresh berries on top of cake. It is the right kind of sweetnes for me. That looks so good and fresh. I love strawberries and I will definitely try this recipe. This is a new and interesting cake recipe to try. Using full fat yogurt in a cake recipe is something I have never done before. Well, there is always a first time and this yogurt cake looks like it will soon turn out to be a family favorite. Yum. I have been ALL about cakes lately. I would love to make this, I bet it tastes just yummy and light! This looks heavenly! I love the little touch of cinnamon too, and that you recommend it for breakfast too – why not? I love strawberries. This looks like an amazing recipe that I can not wait to try. I have never cooked with yogurt before. 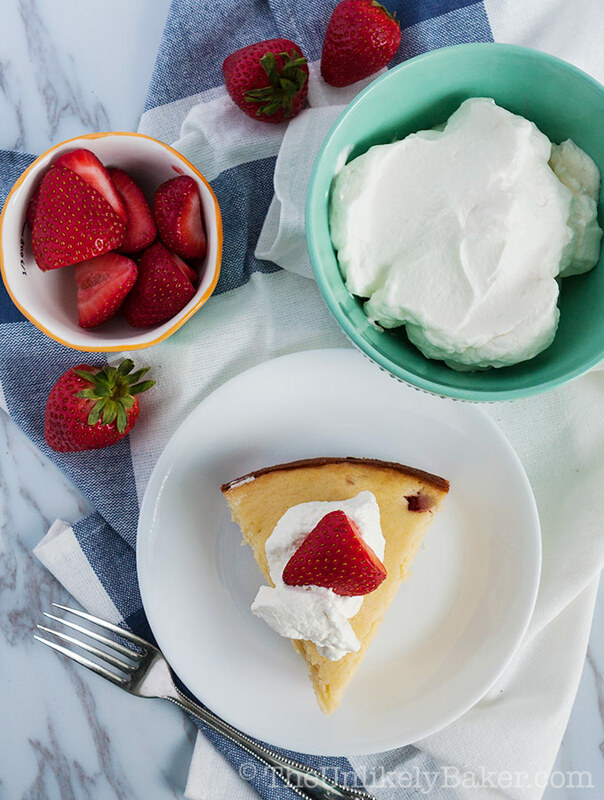 I love strawberries and this is the perfect summer dessert! 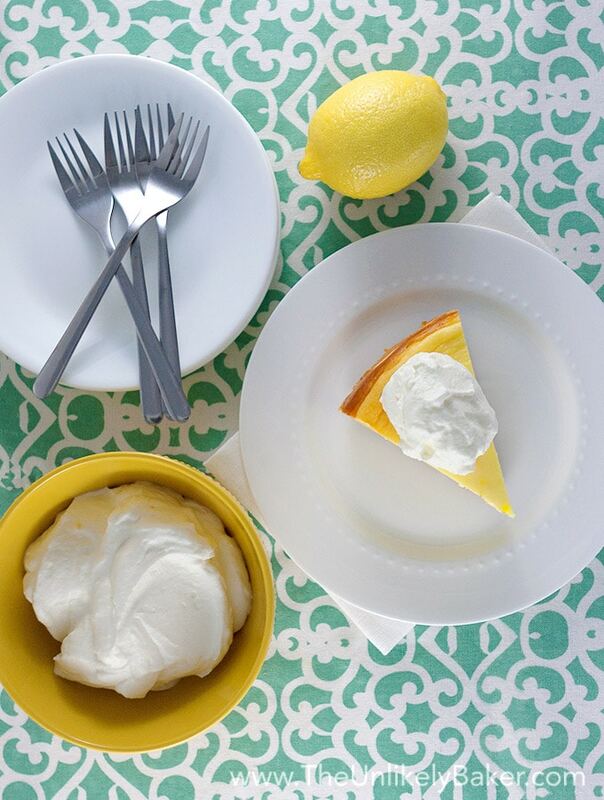 This sounds like the perfect light summer recipe! So great for parties! Great recipe, can’t wait to try. We too always have yogurt at home.